A 31-year old man who has stopped to assist another motorist was struck and killed last night on the Eastex Freeway southbound at Crosstimbers in Houston. The driver of a Pontiac Grand Prix collided with a pickup truck before traveling across five lanes and hitting the good Samaritan by the side of the road. The Harris County District Attorney’s Office has accepted a charge of intoxication manslaughter against the Grand Prix driver. A driver was ejected from his vehicle and fatally injured last night in a single vehicle accident on the Eastex Freeway. 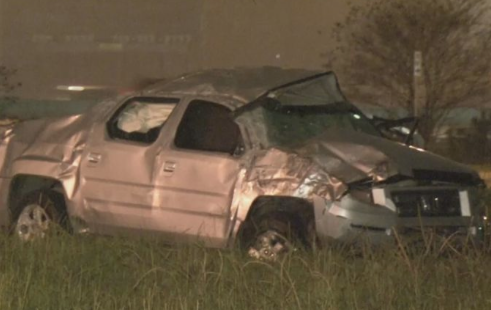 For reasons unknown, the silver-colored Honda Ridgeline pickup truck left the roadway around 11:45 p.m. on the Eastex Freeway near Keeland, striking some signs and poles before beginning to roll over. The crashed pickup came to rest on the feeder road; the driver died at the scene. 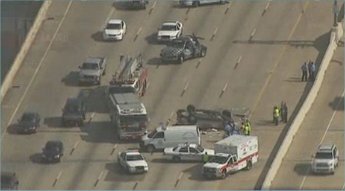 For the second day in a row there has been a major head-on crash on a Houston freeway caused by a wrong-way driver. 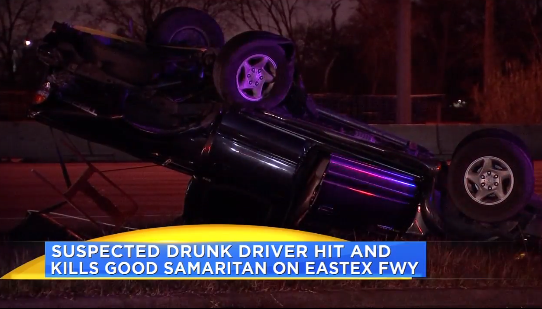 The crash happened on the Eastex Freeway before Cavalcade Street around 3:00 a.m. Tuesday January 13th. The wrong way driver, a male, was heading northbound in the southbound lanes at the time of the collision. The victim was seriously injured and transported to Ben Taub. Police are investigating to determine whether alcohol was a factor, as it very frequently is in wrong-way accidents. 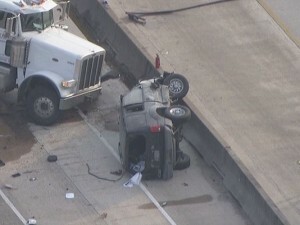 A Houston Police Department officer was injured this morning in a crash on the Eastex Freeway at the North Beltway. The officer was attempting to block part of the freeway at the scene of a previous accident that left debris in the roadway; a car hit the vehicle that spilled the debris, pushing that vehicle into the officer. The officer’s condition was unknown at the time of Channel 2’s report: he or she was transported to Memorial Hermann Hospital. Police say the driver who knocked the vehicle into the officer will be cited for failure to control speed. The crash happened around 11:00 a.m. and the freeway was reopened at 1:10 p.m.
An early morning accident involving several vehicles and at least one death in blocking several southbound lanes of US 59 this morning. Last night’s severe thunderstorms in the Houston area may have been a factor, but Channel 13’s article doesn’t state a cause for the wreck. Update: Channel 11 is reporting that this was a wrong way accident. The accident happened near the George R. Brown convention center when a pickup truck entered the Eastex Freeway heading the wrong way and hit a car head-on, after which a third car hit both those vehicles. 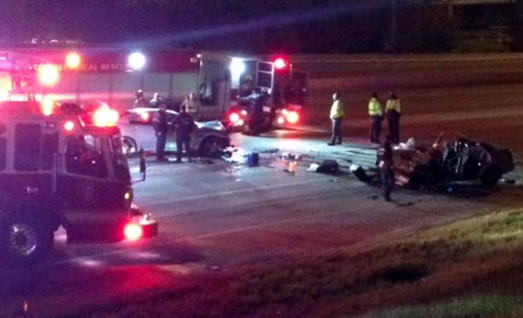 The driver of the wrong-way pickup truck, a woman, was pronounced dead at the scene. The driver hit head-on was in critical condition. An accident this afternoon on the Eastex Freeway (Highway 59) at Parker has reportedly killed a child passenger. Police say a tire blew out on a gray minivan causing the driver to lose control before hitting the guardrail, after which the vehicle flipped over several times. A Channel 13 report states a child passenger was pronounced dead at the scene, and at least two other children and two adults inside the minivan were transported to the hospital. The occupants of the minivan may have been a family returning from vacation as there was luggage strewn at the crash site. Channel 2’s story is here. Channel 11’s story is here. FOX News’ story is here. A car accident last night between a Dominos Pizza delivery driver and a minivan injured several people, including a child. Two adults and a child in the minivan were taken to hospital, the Dominos driver was also injured and taken to the hospital. The accident happened at the intersection of the Eastex Freeway and Tidwell Road in northeast Houston. According to Channel 13’s story, the driver of the minivan ran a red light immediately before the crash. Sometimes after a serious car accident, dealing with the other driver’s insurance company can be almost as painful as the injuries you suffered! Smith & Hassler’s highly qualified personal injury attorneys have handled thousands upon thousands of car accident injury claims over the firm’s 23-year history. If you have been hurt in a car accident and don’t want to risk being given the run-around by an insurance company, contact Smith & Hassler and ask to speak with an attorney.